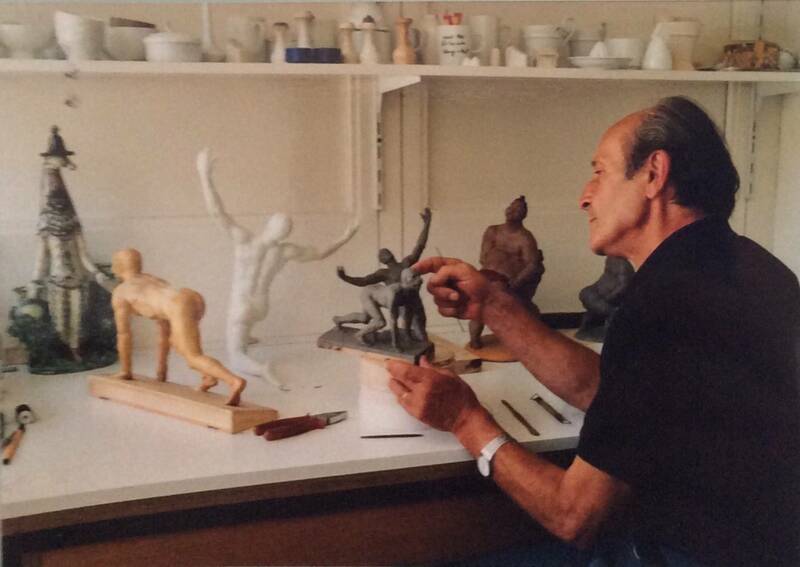 In June 1959 he settled in Germany, as sculptor of the prestigious Rosenthal porcelain factory. 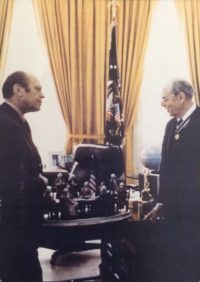 Of this era (1965-69) is the realisation of the famous service entitled “The Magic Flute” (one of which was purchased by the Aga Khan and one by the wife of the Persian Scia, Farah Diba). Among the many achievements is to be mentioned the portraits of 11 composers including Mozart, Beethoven, Wagner, Bach and Verdi. 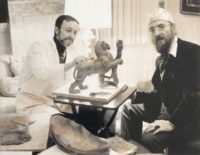 He collaborated with the Danish designer Bijorn Wiinblad and the Viennese painter Ernst Fuchs, major representative of the Vienna School of Fantastic Realism. This relationship has accentuated in Falchi the propensity to venture into interpretative speculations of the human image, which demonstrates a constantly evolving spirit of research. In 1962 for the Tivoli Theater in Copenhagen he created the statue-portrait of Mr. Karstensen, founder of the Tivoli amusement park, for the centenary of its foundation. 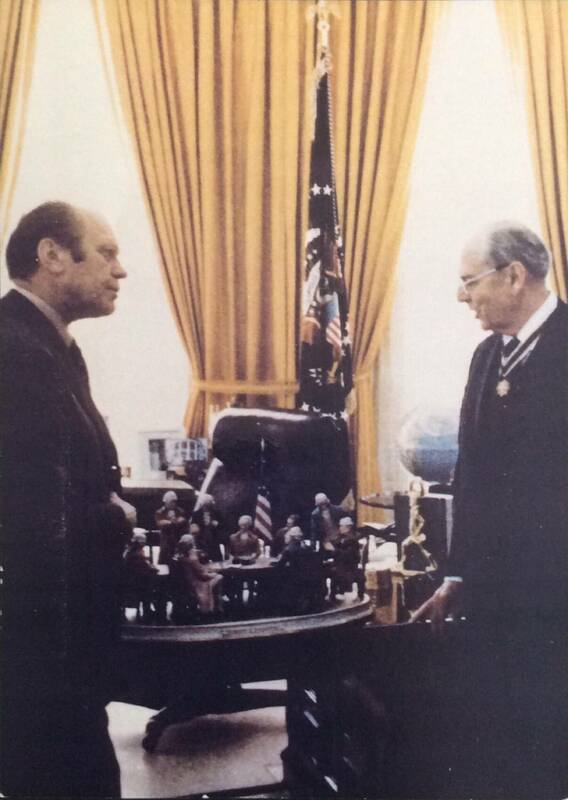 Having acquired a solid international reputation, in 1973 he received the assignment from the US ambassador to create groups of commemorative sculptures for the two hundredth anniversary of the Declaration of Independence. 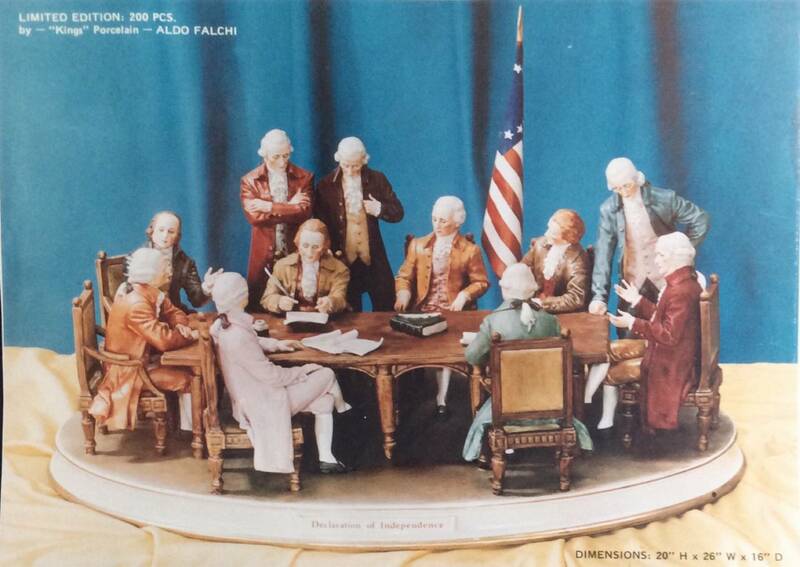 Falchi performed porcelain groups, including “The Declaration of Independence”, 1974, which is on the table of the US President at the White House and a copy at the Philadelphia Congress Center (USA). 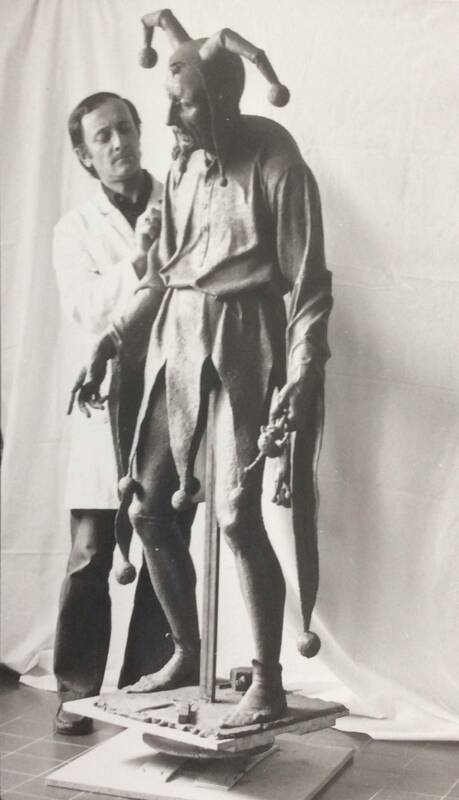 In 1978 he created for the Provincial Tourist Board of Mantua the statue of “Rigoletto” at natural height, positioned in the garden of the House of Rigoletto (Piazza Sordello – Mantova). For the two thousand anniversary of Virgil’ s birth he realizes the Virgil bust and virgilian bas-reliefs for institutional offices, in addition to the official medal. 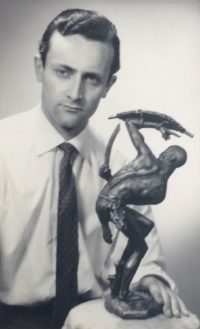 In 1987 he modelled for the Province of Mantua, the medal to commemorate the restoration of the bell tower of the Basilica of S. Andrea and of the Mantegna Chapel, one of which was purchased by the British Museum in London and one by the Vatican. In the ’80s and ’90s he created various monuments, busts and reliefs for public and private institutions. In 1991 for the 400th anniversary of the death of the Duke of Sabbioneta, Vespasiano Gonzaga, the municipality of Sabbioneta (MN) commissioned him a bust of the Duke and six reliefs illustrating the salient facts of his life, which are placed in the atrium of the Municipal palace of Sabbioneta. In 1997 he received the “Agrumello” (Cremona) international career award. Since 2014 he has been involved with drawings, in the creation of paintings, such as the series of oil pastels and watercolors entitled “Accostamenti”, Juxtapositions, which tend to combine classical and figurative art with other more modern and contemporary forms. The research on the human soul and body continues. Vatican, Rome and British Museum, London: medal to commemorate the restoration of the bell tower of the Basilica of S. Andrea and of the Mantegna Chapel in Mantua. Palace of the Duke in Sabbioneta, Mantua: permanent exhibition. Civic Museum of Palazzo Te, Mantua: 1 drawing. Diocesan Museum “Francesco Gonzaga”, Mantua: 1 clay alt relief. Virgilian academy, Mantua: 1clay bust of Virgil and a high relief. 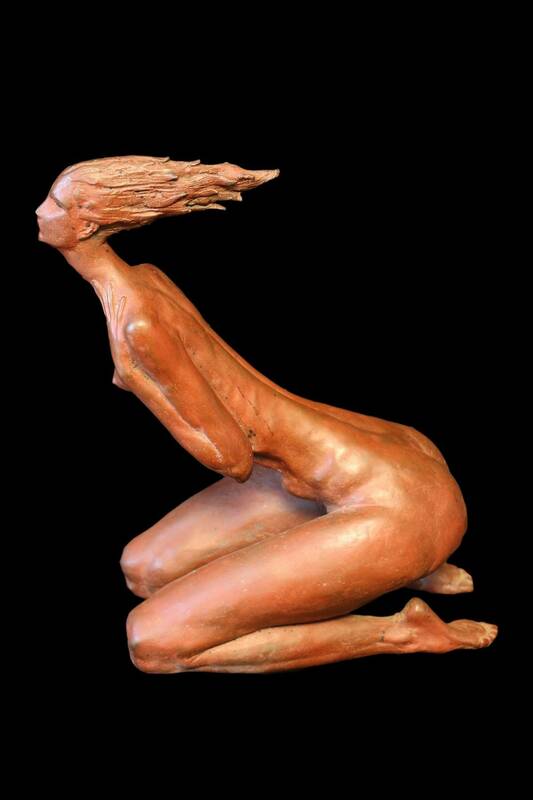 MaM Museum of Gazoldo degli Ippoliti (MN): 3 sculptures in bronze and 3 in clay. Civic Museum of Medole (MN): 2 bronzes and 6 oil pastels. Lodi Civic Museum: Porcelain group “The hunt” of which a copy is in possession of Princess Anne of England. Museum of the Risorgimento, Mantua: 3 clay sculptures depicting 3 Napoleonic soldiers. Rigoletto’s House, Piazza Sordello, Mantua: Monument to ‘Rigoletto’. Palazzo Comunale di Sabbioneta: clay bust of the Duke Vespasiano Gonzaga and 6 clay reliefs depicting scenes from the life of the Duke. The Höhenberg Porcelain Museum in Bavaria is home to a dozen porcelain works made in the 1980s. Numerous sacred art works can be found in churches, cemeteries and public squares in Northern Italy. 1983 September – Solo exhibition, Casa di Rigoletto, Mantua. 1984 May – Solo Ex. organized by the regional families, Piazza Duomo, Milan. 1984 September-December – Mantuan design of the 20th century, Palazzo Te, Mantua. 1985 April – Solo Ex. organized by Virgilio’s Municipality for the “Bicentenary of Manzoni”, Virgilio, Mantua. July – Sculpture Biennial, Medieval Fortress of Reggiolo (RE). October – Solo Ex. dedicated to Manzoni characters, Official Club, Mantua. 1987 September – Collective, Itineraries of the Gonzaga, Palazzo Ducale of Sabbioneta (MN). 1988 October – November – Solo Ex., Palazzo Ducale di Mantua. 1999 May – Bi-personal Aldo and Paride Falchi, Palazzo Ducale of Sabbioneta. 2000 September – Solo exhibition, The sculpture by Aldo Falchi, Museum of Modern Art, Gazoldo degli Ippoliti (MN). 2002 March – Bi-personal: ‘Poetry and form: Paintings by Paride Falchi and sculptures by Aldo Falchi’, MaM, Gazzoldo degli Ippoliti (MN). 2004 November – Collective exhibition, “Mantuan Painters and Sculptors”, at the Arianna Sartori Gallery, Mantua. 2008 December – Collective ‘ Mantuan sculptors of ’900 ‘, Quistello (MN). 2013 April- May- Solo ex. at the Virgilian Museum of Pietole (Virgil-MN) with the participation at the vernissage of the Irish Nobel Prize winner for literature, the poet Seamus Heaney. 2014 March 25 – April 27- Bi-personal “Paride and Aldo Falchi painting and sculpture”, House of Mantegna, Mantua. 2014 September 27th – 24th October Collective exhibition “Spoleto Art meets Venice”, Palazzo Falier, San Marco, Venice, curated by Vittorio Sgarbi. 2014, October – Exhibition at the Salon du Caroussel, Louvre Palace, Paris, curated by Sabrina Falzone’s gallery (Mi). 2015 March 14-27: “Behind the Mask” at the Gallery and curated by: “Artists of Via Giulia”, Via Giulia 194 / A, Rome. 4th Castletown Road West Kensington W14 9HE, London. 2015 -May / 2016-January, annual exhibition at Flyer Art Gallery, Via Palermo n.77, Rome. 2015 July: Solo documentary film realized by Diffusione Arte Tivu ‘of the Orler galleries, Marcon (VE). 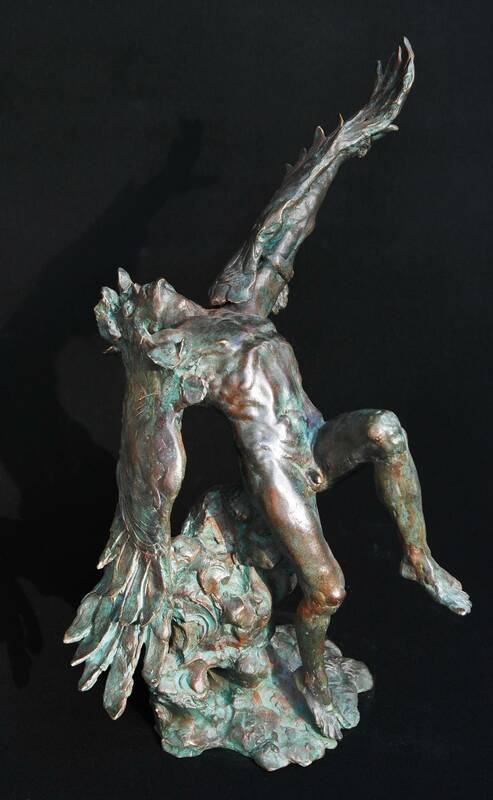 January 2017: Aldo Falchi sculpture and painting, Mantuan Masters, Galleria Sant’Isaia (BO). From June 2017: permanent works at Galleria Sant’Isaia (BO). Benvenuto Guerra (art critic), presenting Aldo Falchi Exhibition at Palazzo Ducale in Mantua in 1988, says: “Considering the vast and complex production of Aldo Falchi, one is strongly impressed by the never interrupted spirit of research and the high and constant quality of his works … in the most recent works his classicism is questioned by a modern sensibility, by a neo-paganism that catches in evocation and in the mythological proposal a source of vital energy, a panic sense and a forgotten thrill of life (of Dionysian ancestry) to be actively reclaimed for the annihilated man of our fearful and weakened present “. “… the mythological theme provides a more precise interpretation of the artist’s Weltanschauung, which seems to grasp and touch, in a sort of sinful descent into the underworld of primordial instinctuality, below the apparent order imposed by all instruments of repression and beyond the much vaunted progress of history, the incandescent magma of vital energy that does not allow itself to be forced into rigid schemes of the system and of the universe of preconceived ideas and behaviors”. ‘Mantuan design of the’ 900 ‘(catalog), Mantua, 1984. ‘Sculptors, painters, engravers in the Mantua of the’ 900 ‘, 1985.